Premium nail hardener in a subtle translucent pink color with a golden shimmer. 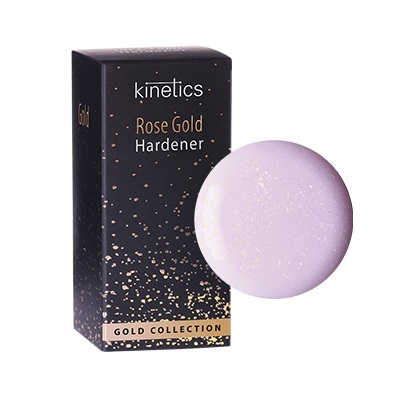 Enriched with pure gold particles, it reinforces the nail plate, stops brittleness and provides nails with a smooth and pearly finish. Use as a base and apply one coat under a colored nail polish onto natural nails. As a shiny hardener with a pearly finish, apply two coats onto natural nails. • Helps to restore dry, damaged and weak nails. • Heals cuticles and prevents nail splitting. • Safe, water based formula features keratine. Butyl Acetate, Ethyl Acetate, Nitrocellulose, Acetyl Tributyl Citrate, Adipic Acid/Neopentyl Glycol/Trimellitic AnhydrideCopolymer, Isopropyl Alcohol, Acrylates Copolymer, Stearalkonuim Bentonite, Styrene/Acrylates Copolymer,Benzophenone-1, Calcium Aluminium Borosilicate, Trimethylpentanediyl dibenzoate, CI 77891, Aqua, Hexanal, EchiumPlantagineum Seed Oil, Polyvinyl Butyral, Methylpropanediol, Silica, CI 77742, Methylthiopropylamido Acetyl Methionine,Laurdimonium Hydroxypropyl Hydrolyzed Keratin, Tin Oxide, Colloidal Gold, Phenoxyethanol, Leuconostroc/Radish RootFerment Filtrate, Tocopherol.